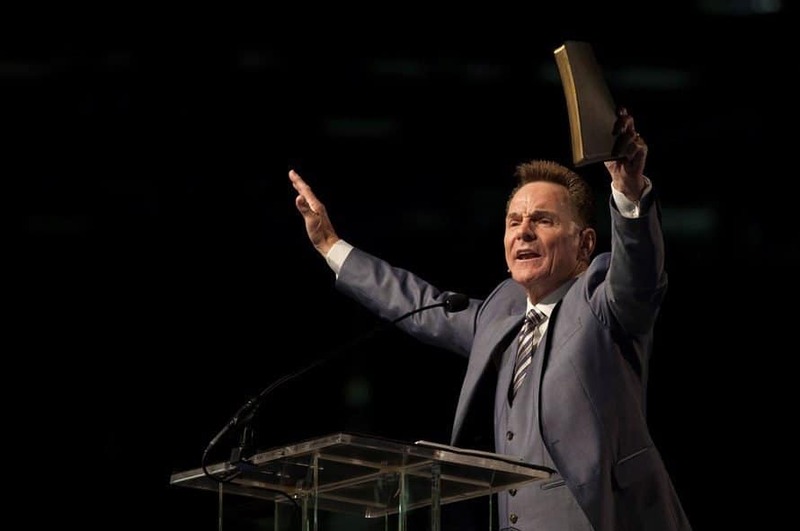 NASHVILLE (BP) – Arkansas pastor and former Southern Baptist Convention president Ronnie Floyd will be recommended for the presidency of the SBC Executive Committee, the EC’s presidential search committee announced March 31. The full EC will consider Floyd’s nomination Tuesday, April 2, at a special called meeting in Dallas to begin at 11 a.m. Central at the Grand Hyatt at the Dallas-Fort Worth International Airport. A press conference and then a Facebook Live session at facebook.com/baptistpress will follow the EC meeting, which may end by approximately 3 p.m.
“Ronnie Floyd is a trusted voice of experienced leadership,” said Executive Committee chairman Mike Stone, an ex officio member of the search committee. “A lifetime of service in the local church and in virtually every layer of SBC life has uniquely prepared him for this critical hour. Dr. Floyd will be ready on day one to lead all Southern Baptists as president of the Executive Committee.” Search committee chairman Steve Swofford’s letter via email to EC members this morning (March 31) relaying Floyd’s nomination follows this story. Senior pastor of Cross Church in northwest Arkansas, Floyd’s SBC service has included two years as convention president, two years as EC chairman and a term as SBC Pastors’ Conference president. During his 33 years at Cross Church, the congregation has baptized more than 22,000 people, according to a press kit distributed by the EC. Cross Church has planted 148 other churches in North America and across the globe under Floyd’s leadership, including congregations in 26 of the North American Mission Board’s 32 Send Cities. By May 1, 2020, Cross Church plans to have planted at least one church in all 32 Send Cities. Cross Church has given nearly $11.5 million through the Cooperative Program during Floyd’s pastoral tenure, according to data from the SBC’s Annual Church Profile. CP is Southern Baptists’ unified method of funding missions and ministries in North America and throughout the world. In 2017, Floyd was appointed president of the National Day of Prayer Task Force, a role in which he has overseen the annual National Day of Prayer emphasis in May. As SBC president from 2014-2016, hallmarks of Floyd’s leadership were emphases on prayer, spiritual awakening and racial reconciliation. At each of the two SBC annual meetings at which Floyd presided, an entire evening session was devoted to prayer for spiritual awakening in America. Floyd’s friendship with Jerry Young, president of the predominantly black National Baptist Convention U.S.A., Inc., eventuated in a November 2015 meeting where 10 Southern Baptist pastors and 10 National Baptist pastors discussed concrete ways to achieve racial reconciliation and foster national healing. Floyd presided over the SBC when messengers adopted a 2016 resolution renouncing display of the Confederate battle flag. Floyd, 63, served in SBC leadership roles during at least two previous notable junctures in the convention’s history. He was EC chairman from 1995-1997, when the SBC adopted the Covenant for a New Century restructuring plan that reduced the number of convention entities from 19 to 12. Fifteen years later, he chaired the SBC’s Great Commission Task Force, which presented a series of recommendations affirmed by messengers in 2010 and aimed at increasing the convention’s evangelistic effectiveness. The GCTF recommendations led to EC recommendations, approved by messengers in 2011, that established Great Commission Giving, revised the North American Mission Board and International Mission Board ministry assignments and reduced the EC’s portion of CP funds from 3.40 percent to 2.99 percent. Great Commission Giving is a category encompassing CP as well as direct gifts to SBC entities, Baptist associations and state convention ministries. As pastor of Cross Church since 1986, Floyd has led the congregation to give $1 million or more through CP annually since 2015, according to ACP data. “Only a few Southern Baptist churches in history” have given that amount, BP reported in 2015. The church’s average worship attendance increased from 1,800 in 1986 (when it was known as First Baptist Church of Springdale, Ark.) to more than 9,200 last year across several campuses. Floyd serves on an informal evangelical advisory council for President Trump. Last year, Floyd said serving on the advisory council is not an endorsement of the president or his policies. Floyd also said he has had opportunity to express the Gospel to Trump. He served as general editor of LifeWay Christian Resources’ Bible Studies for Life curriculum from 2013-2017 and has authored more than 20 books, including “How to Pray,” now in a 20th anniversary edition. He is online at ronniefloyd.com. Floyd holds both master of divinity and doctor of ministry degrees from Southwestern Baptist Theological Seminary in Fort Worth, Texas, and an undergraduate degree from Howard Payne University in Brownwood, Texas. He and his wife Jeana of 42 years have two sons and seven grandchildren. If elected, Floyd would be the EC’s seventh chief executive. Below is the text of a letter emailed to Executive Committee members March 31 by search committee chairman Steve Swofford naming Arkansas pastor and former SBC president Ronnie Floyd as the nominee for Executive Committee president, to be considered during a special called meeting Tuesday, April 2, in Dallas. Your Presidential Search Committee is pleased to announce that Dr. Ronnie W. Floyd, pastor of Cross Church in northwest Arkansas since 1986, is our candidate for your consideration as the next president and chief executive officer of the SBC Executive Committee at the called Executive Committee meeting in Dallas, Texas, this Tuesday, April 2, 2019. Ronnie is no stranger to any of us. He recently served two terms as our SBC president and is the current president of the National Day of Prayer Task Force. He has been a leader in racial reconciliation and has a stellar record of bringing together brothers and sisters from all generations, all races, and all walks of life to work in harmony for Kingdom purposes. We firmly believe he is the man God has uniquely prepared and gifted to lead our Executive Committee at this challenging time in our nation’s and our denomination’s history. As you will see from his curriculum vitae in the Press Kit posted on the Executive Committee website (see here), our nominee has a breadth of local church leadership skills, Southern Baptist Convention leadership experiences, and leadership roles with numerous Kingdom initiatives that have prepared him for such a time as this. Our committee is uniformly and unanimously convinced he is the right man for the job. In our many conversations with him, Dr. Floyd has communicated a clear and compelling vision about mobilizing and assisting the churches of the Convention in expanding the reach of the Gospel across our nation and around the world. He is a personal soul-winner; and he equips others to launch out into the deep waters of lostness to become fishers of men. He has a deep, personal prayer life; and he calls others to a passionate pursuit of prayer and holiness. He has a proven track record of organizational and administrative effectiveness that we believe will serve us well as he seeks to lead our Executive Committee and our Convention in fulfilling the Great Commission. Your search committee asks you to be in fervent prayer as we gather in Dallas to consider Dr. Ronnie Floyd as the next president and CEO of our Executive Committee. We pray the Lord will guide all of our hearts as we make this important Kingdom decision.